This summer is disappearing way too fast. But we have done some fun things at least. Like the cruise. I loved the cruise. I miss that beach in Nassau. I could have stayed at that beach for hours on end. And that blue water. So beautiful. Since we have been home we celebrated the 4th of July. Cisco turned 27!! So we celebrated by going to Moochies. 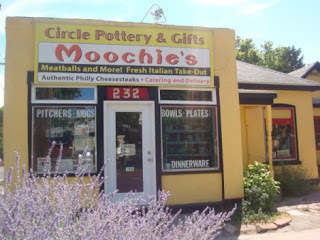 If you live in Utah and you haven't tried Moochies, I HIGHLY recommend going there. The Philly Cheese Steaks are delicious. And their Jalapeno sauce is our favorite. I usually get their amazing Tomato and Feta or their Tuna which are also super yummy. It is on 800 South in Salt Lake and about 200 East. You don't want to drive by this place without stopping. We also organized our closet. And most recently we got callings at church. We are teaching the Valiant 9 primary class. We teach around 10 kids. It will be a new adventure! I loved all the pics!